Primary Natural Resources bauxite, gold, diamonds, hardwood. 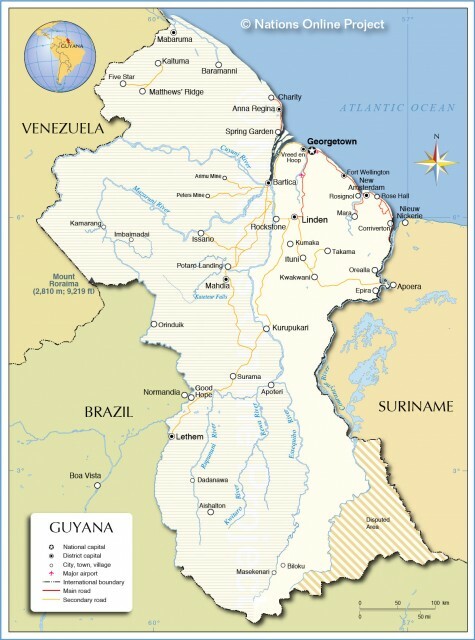 THE NAME Guyana possibly comes from a local native word meaning “land of water,” but it could also derive from the word for “honorable people.” These Carib roots help demonstrate Guyana’s difference from the rest of the South American continent as one of the three non-Hispanic states on the northeast coast, wedged between VENEZUELA, BRAZIL, and SURINAME. Culturally, linguistically and economically, the three Guianas (along with Suriname, formerly Dutch Guiana, and FRENCH GUIANA) belong to the Caribbean region, and have been members of Caribbean regional associations since their inception. The former British Guiana has a coastline of 285 mi (459 km), with the rest of the country stretching inland, encompassing the watershed of the largest river, the Essequibo, as it drains from the Guiana Highlands to the ATLANTIC OCEAN. The coastal regions are swampy, with river estuaries that provide an abundant harvest of shrimp, one of Guyana’s major exports. Much of this area is below sea level and relies on extensive dykes and drainage systems; still many houses are built on wooden stilts. The interior gradually increases to small hills, forest uplands, then mountains (the Pakaraima Mountains, up to 3,000 ft or 915 m shared with Venezuela and Brazil). Unlike the other two Guianas, Guyana also extends south of this band of mountains, into an area of tropical savanna grassland. Aside from this, forests cover approximately 80 percent of the country. Hardwoods are exported and used for the manufacture of wood products, but forestry is possible only in areas accessible by existent roads or navigable rivers—both very limited beyond the first foothills. The frontier between lowlands and highlands is marked by striking natural features, including Kaieteur Falls, one of the highest waterfalls in the world (total drop of 822 ft or 250 m). The highlands also contain significant mineral wealth, especially gold, but also diamonds, manganese, copper, and molybdenum. Bauxite (used to produce aluminum) was a big business in Guyana since the opening of the Demerara Bauxite Mining Company (DEMBA) in 1917. Reynolds Metal Company followed in 1953, and these two companies formed an essential component of the country’s economy. After independence from Britain in 1966, both companies were nationalized, and production declined in the following decades, until production was stopped altogether in 1983. Other resources remain unexplored and are potentially significant (iron, lead, silver, platinum) but are located too far from main roads or rivers to be commercially viable, and claims from Venezuela to nearly 70 percent of Guyana’s territory (the land west of the Essequibo) have also deterred some foreign investors. The remoteness of much of southern Guyana was also an attraction for the People’s Temple cult, originally from the UNITED STATES, which made international headlines in 1978 after the mass suicide/murder of nearly 1,000 of its members.